Habit: Shrub 5--15 dm, with many slender branches from base. Stem: branched below; young stem hairy; older stem with fissured bark. Leaf: scattered along stem; petiole 6--12 mm; blade 2.5--4 cm, ovate to deltate, acute, silvery green, canescent. Inflorescence: heads radiate, 1; peduncle canescent; involucre 8--14 mm; phyllaries ovate. Ray Flower: 14--25; ray 10--25 mm. Disk Flower: corolla 5--6 mm, yellow. Fruit: 5--7 mm; pappus generally 0. Chromosomes: 2n=36. 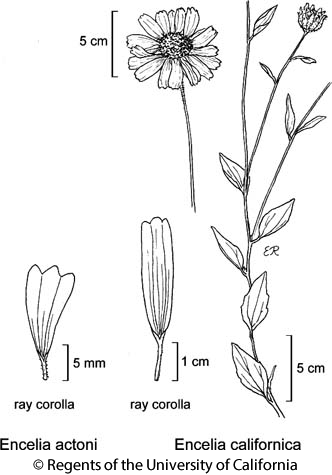 Citation for this treatment: David J. Keil & Curtis Clark 2012, Encelia actoni, in Jepson Flora Project (eds.) Jepson eFlora, http://ucjeps.berkeley.edu/eflora/eflora_display.php?tid=2562, accessed on April 24, 2019.
s SNF, s SnJV, n TR, e PR, W&I, s SNE, w D; Markers link to CCH specimen records. Yellow markers indicate records that may provide evidence for eFlora range revision or may have georeferencing or identification issues. Purple markers indicate specimens collected from a garden, greenhouse, or other non-wild location.